The BR Class's 24-25-26 where all designated Type 2. Class 24s where built at Derby Darlington and Crewe Loco Works 1958-1961.151 in total were produced. Equipped with Sulzer 6LDA28 1160 hp ,Prime Movers and and a top speed of only 75 mph. To improve upon speed the Class 25 was introduced which had the Sulzer 6LDA28-B Prime Mover at 1250 hp and top speed of 90mph. 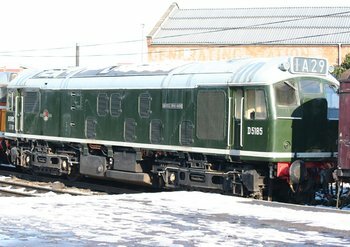 327 Class 25 locos were built at the same loco works. The Class 26s where Built at the Birmingham Carriage and Wagon Company 47. They were built between 1958-1959, with a Sulzer 6LDA-28 1160hp Prime Mover, with a top speed of 80mph. Author: John McMasters Custom sound scheme. Sept 29, 2013 NOT for resale. of the throttle range. 72-127 or higher is OK when your motor takes very little current.